Autumn is the perfect time for plaid, don't you think? I sure am enjoying this cooler weather, and I am very much enjoying making Autumn cards. I began this card by stamping the plaid background in my Misti. As it turned out it did not need another stamping, how unusual is that? I wanted it on the lighter side as I was using the darker base. I then die cut the plaid with my wonky die set. Next, I stamped the stamp using pigment chestnut ink and heat embossed with clear embossing powder, adding colour with my water colours. The Autumn sentiment is die cut three times and stacked for more dimension, and attached on the panel that is then attached to the plaid on foam tape. And, yes, a few sequins to finish. Products: Right at Home Gingham Plaid, Penny Black Lush and Lavish Stamp Set, Frantic Stamper Autumn Die Sentiment, Bazzill Cardstock, Aura Cardstock, Fabriano Hot Press Watercolour Paper, Tim Holtz Distress Inks Dried Marigold and Carved Pumpkin, Colorbox Chestnut, Clear Embossing Powder, Foam Tape, Sequins. 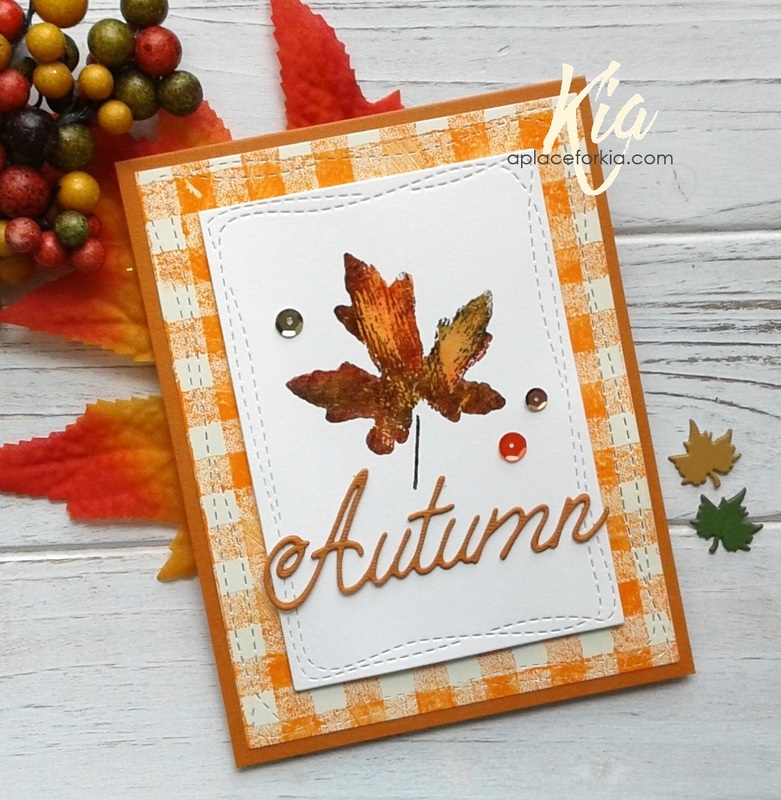 Great autumn card, with a perfect color combo.